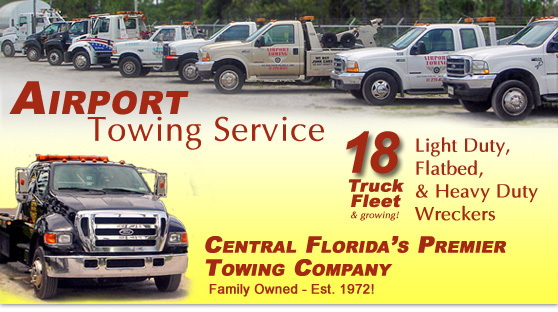 Airport Towing Service is a family owned business, located at 6690 E. Colonial Dr., Orlando, FL. We have been in business since 1972! Like any other business, Airport Towing Service started at the bottom and has diligently worked very hard to reach the top! Airport Towing Service has always taken pride in servicing every call received twenty-four hours a day, seven days a week. We do this with twenty-four hour dispatchers, which allow you to speak to a REAL person, not an answering machine. Airport Towing Service has what it takes to give the best possible service to all of our customers. Our personnel are certified by Professional Wrecker Operators of Florida (P.W.O.F.). We also have a highly trained office staff, with the newest equipment to give top notch service! Currently, we have eighteen damage free trucks in our fleet, including light duty wreckers, flatbed wreckers, and both medium and heavy duty wreckers. It is the duty of Airport Towing Service to give the most professional tow to each car, truck, motorcycle, boat, tractor-trailer, or whatever vehicle and situation our operators are faced with. Airport Towing Service is contracted to tow for the Florida Highway Patrol and Orange County Code Enforcement. We service the Colonial Plaza, Fashion Square Mall, All Fleet Services, and many more commercial properties, apartments, and home owner associations. We serve all of Central Florida, Orange County and surrounding areas including Lake County and Volusia County. We generally serve all areas between Daytona Beach & Tampa. We will also tow out of state and long distance tows, as well. Yes, Airport Towing Service's fleet has grown in size, and our family as well. We look forward to many more generations working with the community.